Courtney and Tanner’s engagement session was such a blast! When we started planning for it, Courtney knew she wanted a location that had a rustic feel to it, and after sharing a few samples, we settled on this log cabin location in Green Bay. A fresh layer of snow had just fallen and the day was bright and sunny. The cold temperatures required some layering up, but Courtney and Tanner had one another to keep warm. With a few car breaks for fingers and faces, we had a great opportunity to photograph throughout the space and capture cabins, evergreens, and lots of snow! Courtney and Tanner have been together four years and have the sweetest little baby girl, Ainsley, and a snuggly fur-baby, Baxter. We are so excited to celebrate this milestone with them and look forward to photographing their reception next October! Here in Wisconsin the winters are long and it really gives us two options; we can stay inside for months on end, or we can learn to appreciate the snow and tolerate the chilly temperatures. For many people (Ben included) the prospect of winter sports like skiing and ice fishing make the season something to look forward to, but for the rest of us, we need something else to help us through. For me, that something is the cozy factor. Like most people, I love warm, summer days where the light is long and jackets aren’t required, but one thing winter does better than any other season is provide us with a reason to snuggle close to our loved ones. Winter is wool blankets, candles in the windows, and silent, snowy nights. As a photographer, winter gives us so much to work with — there are the snowflakes clinging to tree branches, families snuggled under blankets, couples holding one another close, and kiddos playing in the snow. Everything is intimate, the closeness amplified by the cold temperatures. There are limits to when it is safe to be outside for extended periods of time. Just like a rain date in spring, we keep “cold dates” in winter in case the temperature or windchill are unsafe. If it’s a couple’s session, 15 degrees many be tolerable, but if it involves young family members, we are better off waiting for a warmer winter day. Cold, wet feet are the end of a session, so prepare by choosing appropriate footwear, namely boots. There are so many options for cute boots and socks for adults and kiddos alike, that there is no worry of finding something that will work well in photos and still keep you warm and dry. Every session we photograph takes place a few hours before sunset to ensure the most flattering light. In winter, we build in a little extra time knowing that we will need to take breaks every ten to fifteen minutes to keep everyone comfortable. We also choose locations where vehicles can be parked nearby or where there is a heated building just steps away. This way when the cold starts to bother, everyone has a moment to warm their hands and reset. Fingers are usually the first thing to get cold. Although most people choose not to wear gloves in photos, we suggest having them along to slip on between photos. We also recommend hand warmers in each pocket. It’s amazing what a difference they can make! We love getting the perfect shot in falling snow with a snuggling family, but safety always comes first. We would never put you or your loved ones at risk by choosing a remote location, or pressuring anyone beyond their comfort zone. Feel free to CONNECT with us to talk about your vision for a winter session and how we can make beautiful, unique photos happen while keeping everyone safe. Every now and then a traditional engagement session just isn’t practical for the couples we work with. Either they live out of town, the time until their wedding date is short and feels too rushed, or they are combining their families and a different type of session makes more sense for their lifestyle. This is why we include Together Sessions in our wedding packages instead of traditional engagement sessions. Together Sessions allow couples to use the session how ever they need — involving children and pets if that’s what feels right, or waiting to use the session post-wedding as an anniversary celebration. That is what Miranda and Kyle decided to do. 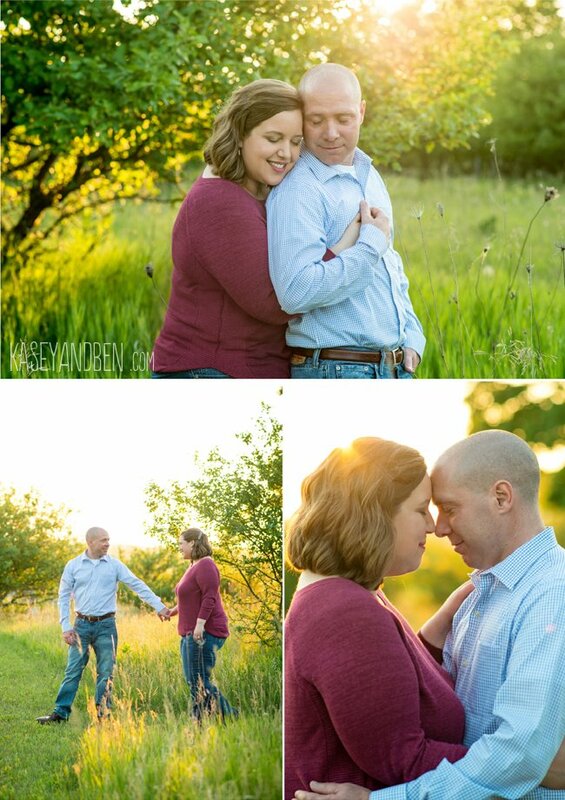 In early summer they tied the knot at the beautiful Simply Country Barn and in fall we met up at Barkhausen Waterfowl Preserve in Suamico to photograph their Together Session. Miranda and Kyle love spending time outdoors together, hiking and collecting antler sheds, so it was only natural to choose a location that was woodsy and natural. The leaves were just starting to change in shades of yellow and green and we loved getting to see this sweet couple again! Cory and Stephanie are dream chasers. They are ambitious and kind-hearted, the sort of people who find out what needs to be done and make it happen. Knowing they would make a good match, their mutual friends spent a long time trying to set them up. Luckily they acquiesced and just over two years later, here we are. 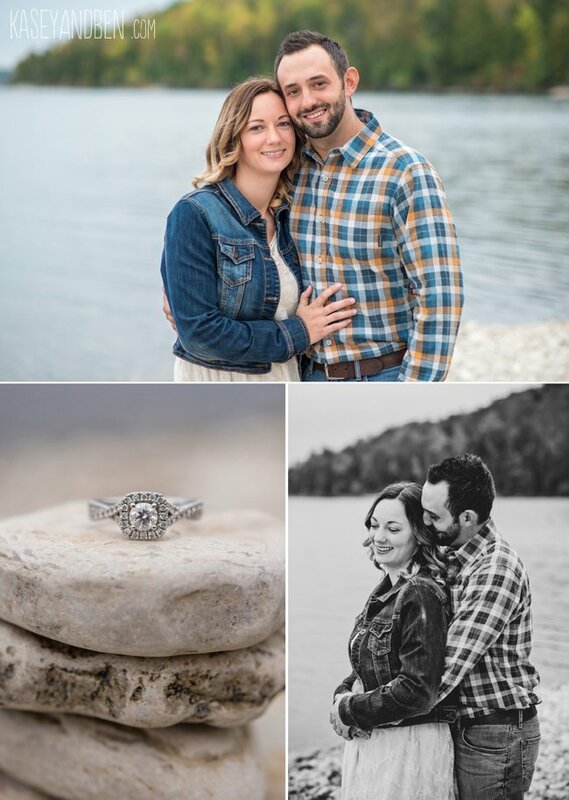 As we started planning their engagement session, Cory and Stephanie brought up the idea of photographing at the site of their future home in Brussels, Wisconsin. Cory grew up there, and the land is gorgeous – fields, trees, water, and the most incredible view of the sun going down over farm fields. The location was not only beautiful, but also full of meaning: fond memories of the past, and hopeful dreams of their wide open future. Can’t wait to celebrate with these two in just a few short weeks! I met with Lauren and Zach over drinks at Kavarna in downtown Green Bay, only to find out that’s where they had their first date nearly four years earlier. They gathered for tea which blossomed into a relationship built on so many things they share: biking travel, music, and spending time outdoors. Although their engagement session date predicted lots of rain, we ended up with a bright, clear day to walk around Botanical Gardens, take photographs, and chat about their wedding plans. We are looking forward to kicking off our 2018 season wedding with them at Meyer Theatre and Tundra Lodge this April. Best wishes and happy planning, Lauren and Zach! For Brittany and Tim, Door County is their getaway place, so as we planned their engagement session, we knew we would be heading north. Potawatomi State Park is one of our favorite locations to photograph because of the diversity – woods, water, beach – it’s got it all. Their day was beautiful and warm with overcast skies and and tree-filtered light. 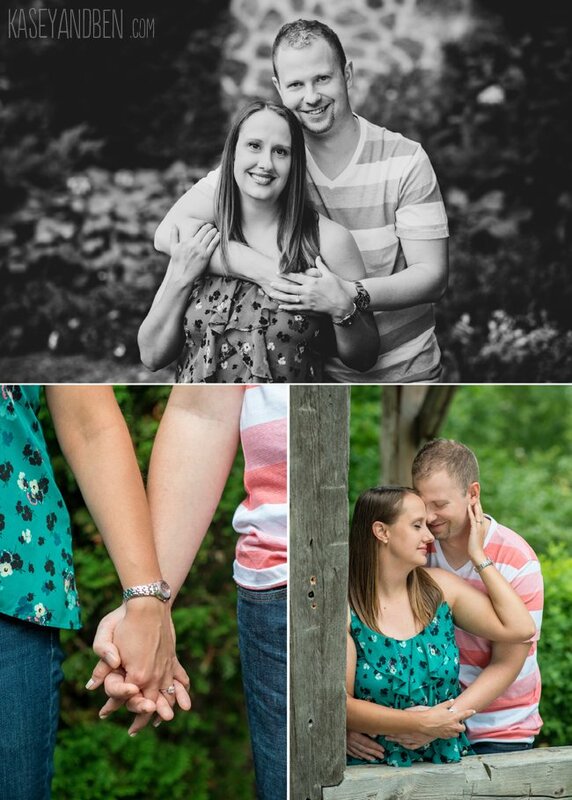 Brittany and Tim met through mutual friends nearly two years ago. On their first date they started the day with mini golf at Bay Beach, but a day date turned into lunch, and then into a movie until they had spent the entire day together. It was only a short time before they knew that each of them had met their match. On a spring day, Tim woke up and knew he wanted to propose to Brittany that morning. He had planned to wait, but something about that day told him it was the right moment. 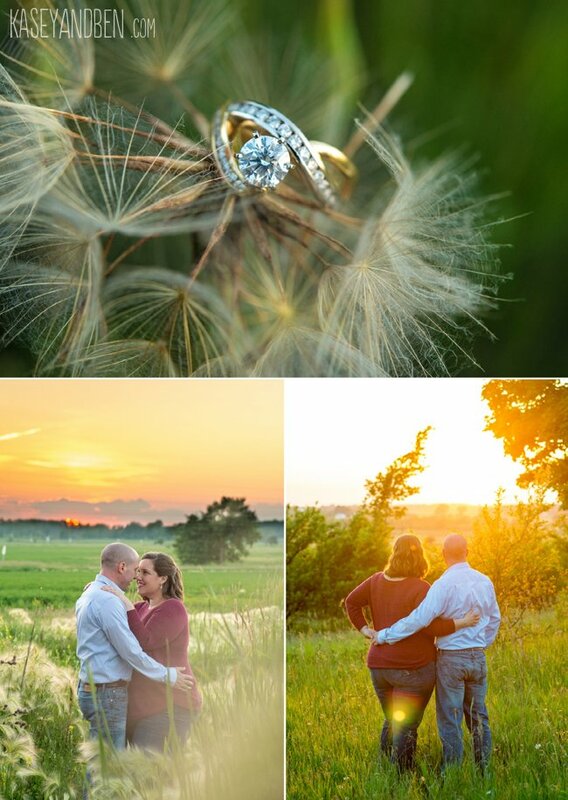 He asked her to go for a walk at Green Bay Botanical Gardens and he tucked the ring into his jacket. Partway through their walk, she was cold and asked for his coat; as he helped her into it, he crossed his fingers that she wouldn’t tuck her hands into the pockets. At the top of the overlook, he wrapped his arms around her and snuck the box from his coat; moments later he asked and she said yes! This couple is so sweet together. They know that life isn’t all celebration; they have seen the harder sides of things. But they face everything together, leaning on one other for strength and greeting each day with optimism and thankfulness for each other. Congratulations, Brittany and Tim! 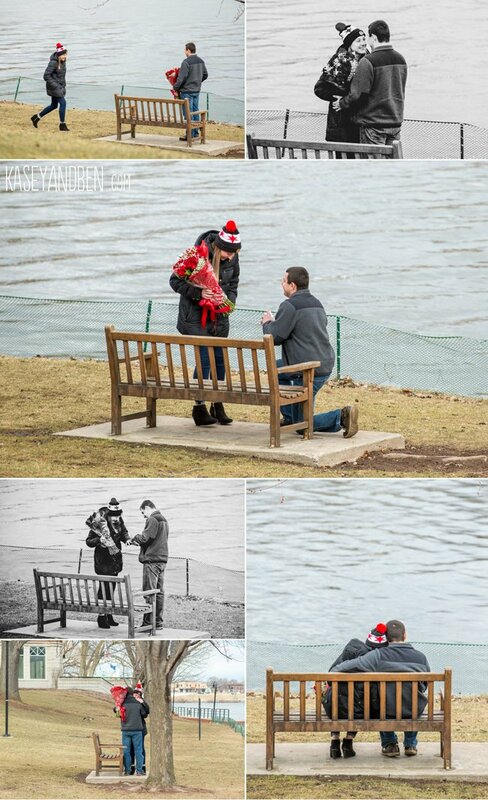 Back in March Chris contacted us to photograph his surprise proposal to Carly. After chatting with him, we realized how much of a surprise it was! The couple lives in the Chicago area, but Chris was planning a girls’ weekend with Carly’s friends to get her up to Green Bay without being aware of his secret plans. 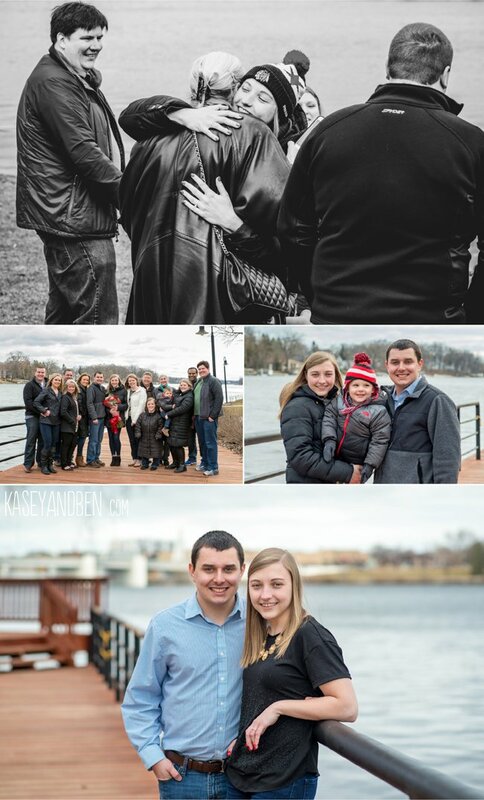 Chris and Carly began dating at the beginning of their freshman year at St. Norbert College in De Pere, so even though they now live out of state, proposing to her in the place where it all began was important to him. The date fast approached and Chris was able to coordinate all the many people who were to be a part of the surprise. As Carly and her friend walked along the Fox River, they turned the corner by the St. Norbert docks to see Chris waiting waiting at the bench where the two of them started dating. In his arms he held three dozen roses, and as she approached, he knelt down and asked her to marry him. As Ben and I hid behind buildings capturing the moment, both their families came from across campus, running down the hill to greet them and spend the weekend in celebration. Even with the chilly, cloudy weather, Carly slipped out of her jacket for a little mini engagement session on the beautiful campus where it all began. Congratulations, Chris and Carly! Staring out my office windows, there is nothing but sunshine. 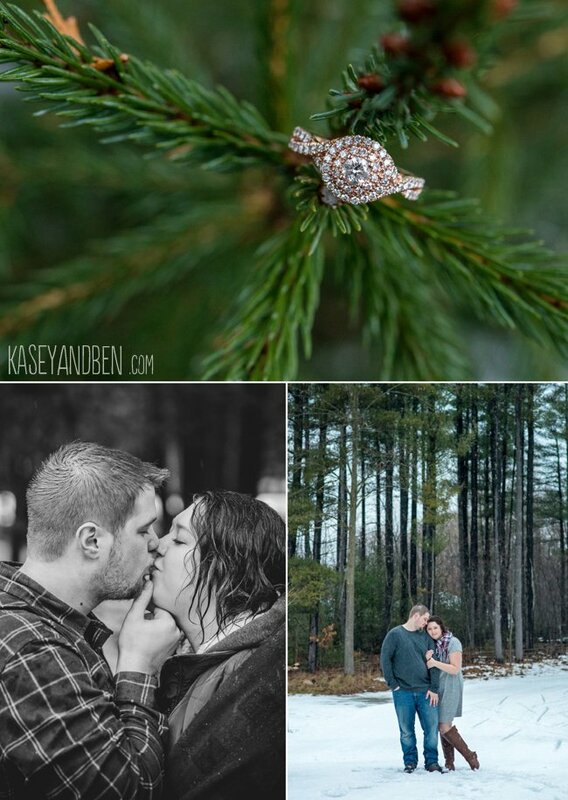 It’s hard to imagine that just a few weeks ago there was a fresh blanket of snow on the ground, and tiny, spiraling snowflakes falling overhead for Regan and Zach’s winter engagement session in Suamico. The evergreens were made even brighter by the precipitation, and although the wet snow made the cold day colder, Regan and Zach were happily teasing one another and laughing as we wandering through the woods. The couple met three years ago after being set up by mutual friends. It’s not often we hear brides and grooms tell about romances that began with a blind date, and I think the success of their meeting has to do with how well their friends know them. Whether or not Regan and Zach knew what they were looking for, their friends knew what they needed. This one is a love story with a side of best-friendship. Congratulations, Regan and Zach; we can’t wait for your October wedding! I love changing seasons; it’s a distinct part of my personality. When it’s summer I want to be on a boat in the sun and when it’s winter I want to be snuggled with hot cocoa. This love for the changing seasons influences our photography, and all it takes is a quick scroll through our Instagram feed to see the crisp blues and warm sunset pinks of summer shift to the bright oranges and rich crimsons of fall, and then to the evergreens and creamy tones that color the world before the winter snow settles over them. 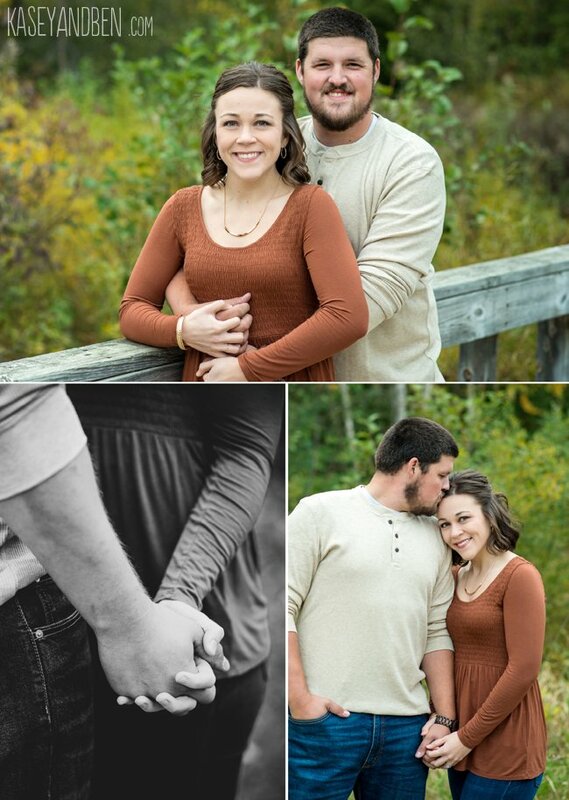 Cora contacted us from Madison to set up the session for their short visit to Green Bay. Eric was living in Colorado (where they would soon be settled together) and we found the perfect date that fit all our schedules. Cora and I brainstormed a few ideas to fit the rustic, woodsy look they were going for, and we settled on a spot with log cabins and pine trees. 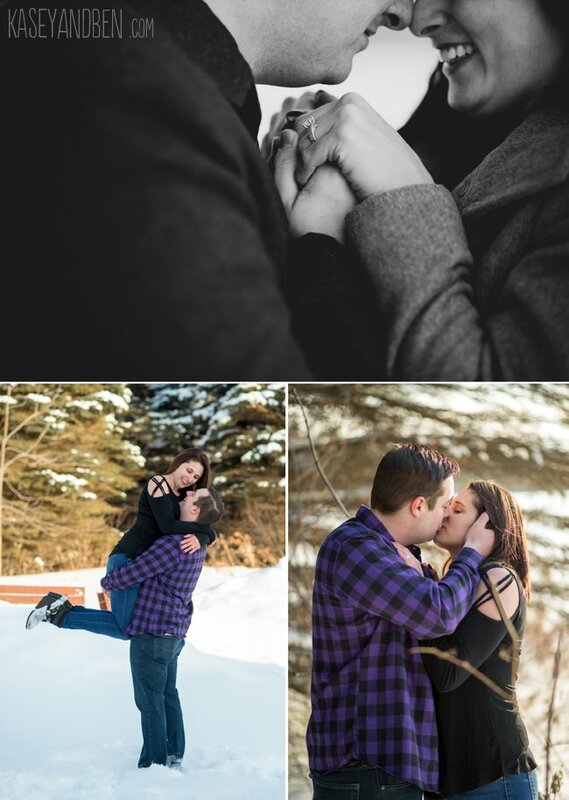 Since winter engagement sessions are all about the cozy factor, we even brought along a little hot chocolate to add to the wool blanket winter snuggles. Cora and Eric were so natural in front of the camera and just happy to be together. Congratulations, Cora and Eric! Looking forward to your wedding day!